In a windowless room in some nondescript corporate building, but with IKEA furnishings, a clandestine team of crowd physicists and spatial hackers is busy modeling a switching IKEA labyrinth in which these tracings and trajectories of consumerist boredom are whirled unto themselves. These men who stare at IKEA furniture have been tasked to design a store that can snare cool hunters into a continuous delirium of consumption, only releasing them when bankruptcy is just one shelving unit purchase away. Show rooms seem to flow endlessly into other show rooms, never towards an exit. Countless bounds but boundless. The same corner sofa with the taste-affirming Swedish appellation is passed by a dozen times. On the thirteenth pass, comes overwhelming desire, mortgage payments be damned. Next door, meanwhile, a fellow employee is also busy crunching numbers. 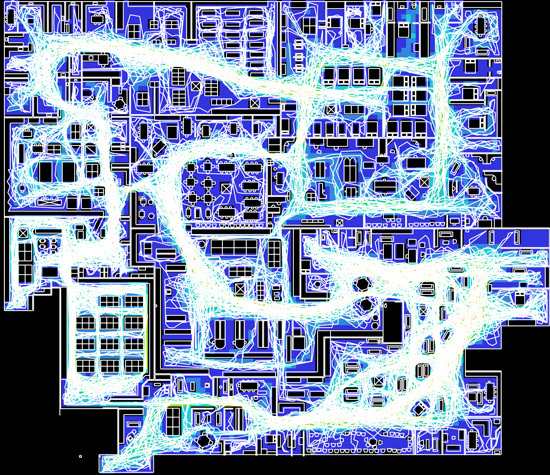 This rogue among rogues has been tasked to weaponize the work of his colleagues, to design an IKEA store as simulant city in which one could trap would-be occupiers and confuse them with self-knotting streams of generic spaces, a labyrinth within labyrinths, until they can be neutralized.